This is not a typical christmas dish, but I couldn’t dare not to share this brilliant recipe with you. A tolerant not too heavy burger plus fries made of parsnips. 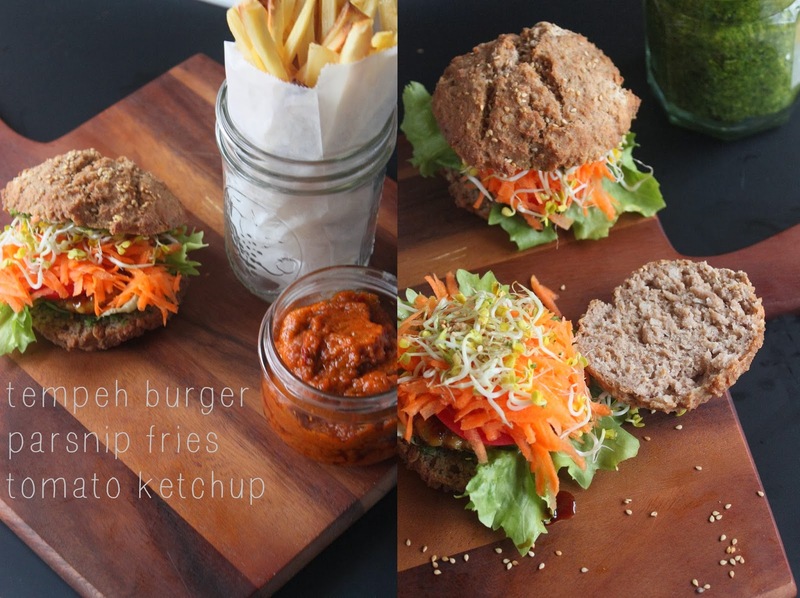 Healthy wholefood ‘fast food’! The rare light these days would not let me shoot it for few plenty of days and so I had some extra time to upgrade taste & texture. Especially the buns could benefit from it. They are gluten free and now extra crunchy! The main part goes to the tempeh piece in between the bun. It is crispy, sweet and salty! And a welcome change to common vegetarian burger patties. 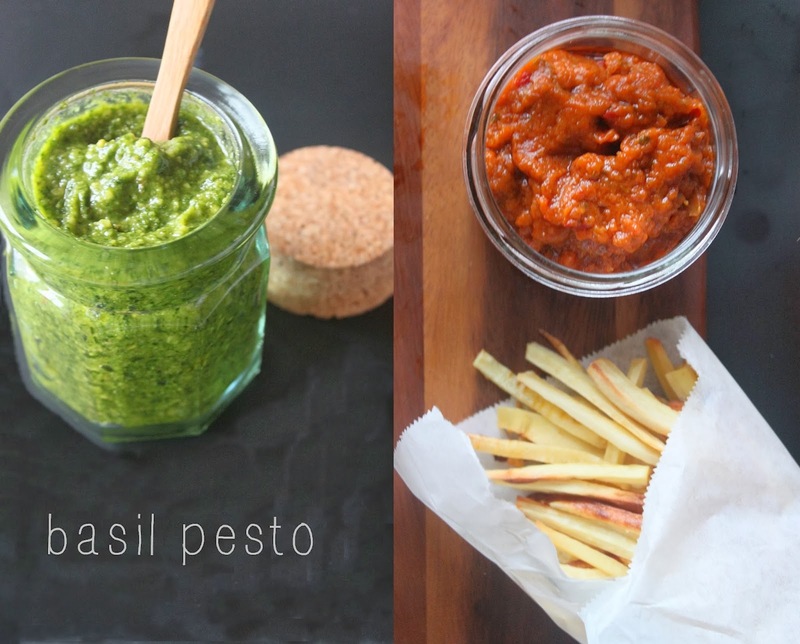 Instead of mustard or mayo I made a delicious basil pesto as a spread. 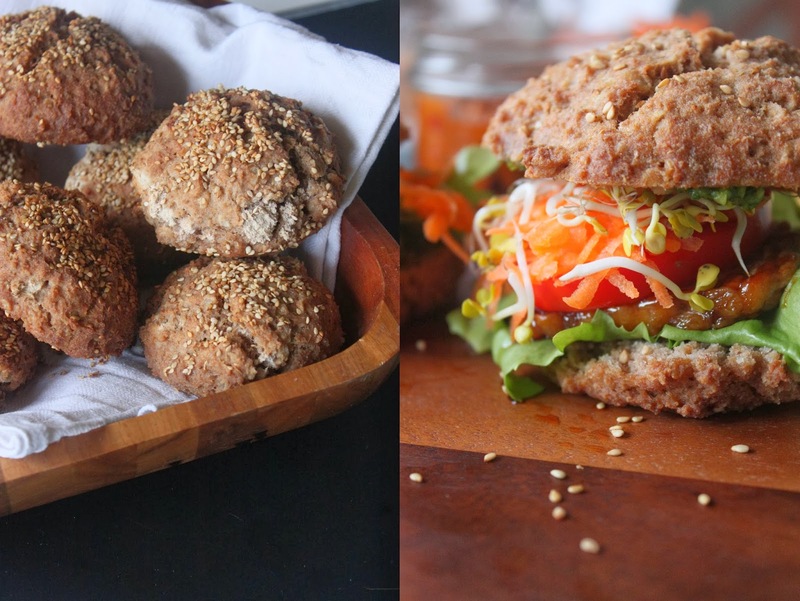 The many many flavours of basil, tempeh, sprouts and textures of the salad, carrots and the bun play together so well! Warning: Maybe not the best idea for a first date cooking dinner as it is a rather inelegant messy kind of eating experience. A fun one indeed but it’s your turn or maybe you simply don’t care because who does? The beauty part is up to the food and it definitely wins everybody over! Combine all ingredients in a large bowl. Add the warm water. Stir with a spoon for two minutes. Add more water if needed. Form 8 little buns in your hands and place them onto a parchment paper baking tray. Brush the top with olive oil and sprinkle with some sesame seeds. Bake for 30 minutes at 225°c / 437 F. Place a bowl with hot water in the oven. Last 2-3 days or freeze the rest. Cut the tempeh into bun sized pieces. Melt the coconut oil in a pan on relatively high heat. Fry the tempeh on both sides until gold brown. Add the maple syrup and lower the heat. After a few minutes deglaze with the soy sauce. Finish with fresh ground pepper. Put the pine nuts in a pan and roast them for a few minutes on high temperature. Keep an eye on it and swing the pan a few times. To cool them off, transfer onto a cold plate. Add some olive oil to the pan, cut garlic in two slices and roast 1-2 minutes. Mix all ingredients in a food processor. Add more oil for a runnier pesto. Store in a glas jar in the fridge. Peel and cut the parsnips in the middle and then into 4 thin slices. Cut again into frie sized pieces. Take a plastic bag to put the fries, salt and coconut oil. Close the bag and give it a shake to scatter the oil equally. Lay the fries onto a parchment paper baking tray. Bake for 25 minutes at 200°c / 392 F.
Cut the tomatoes in 4 halves and roast them together with garlic and onion for 40 minutes at 200°c / 392 F.
Add the roasted tomatos to the other ingredients in a food processor. Store in a glas jar in the fridge. Lasts for one week or longer unopened. Spread the pesto on the inside of the bun, follow with salad, tempeh, tomato, carrots, sprouts and the other half of the bun. Fries + Ketchup = Dipping. Pretty easy. You know the game. Take a huge bite. munch. dip. be happy! In all the busy-ness that is life right now, and despite the word fast in ‘fast food’, let us try to be still and conscious of every moment these last days of the year. Beware of rushing things, thinking too many thoughts, panic about time, food, gifts, wrapping. Instead take a deep breath while doing something e.g. preparing food ( like some beautiful good smelling buns in the morning ). Put some love into it. Add a little bit of never-mind-attitude. Sprinkle with a huge load of gratitude. And last but not least enjoy every step, minute, failure, success, smile, hug, kiss and bite of it! Christmas is a celebration of all senses and emotions! And so should be the dining. Whole and good! I wish you all the very best this year. Have a wonderful, healthy and happy holiday everyone! Do you have a way to slow things down this time of the year? I am curious! Any wise sayings? Tell me here or over there! Love to hear from you!